A Sikh, oft’ seen sporting a turban. The future is a frustratingly unpredictable thing. Perhaps most frustratingly, when there are predictable events in that future but the circumstances in which you expected them to take place do not turn out as anticipated. For example, our second child is on the way imminently, but I was recently made unemployed and totally didn’t see it coming. Now we are scrambling to figure out how to extend health insurance coverage in order to avoid having to ruin ourselves financially in paying for the hospital stay. You know, that kind of nuisance. It is in times like this, when a little perspective is required and reassuring phrases like “we’ve endured worse than this before” or “we’ve taken bigger risks than this” start getting bandied around, as if, by repeating them mantra-like, one starts to believe them. In fact, it is remarkable the power that these personal pep-talks have. Having been virtually speechless for the several hours after my dismissal, the moment that I started such utterances I began to feel better and more in control of my situation. Of course, it is rather easier to say than to do, but three weeks on, I remain bullishly optimistic about where things are headed, in spite of being three weeks closer to being a parent of two children on no salary. Indeed it was a Manchester United scarf, I told him, at which point a broad smile emerged from under the bushy eaves of his mustache. “I had lunch with Ron Atkinson a few times back in the ’80s, you know.” “Really?” I replied, instantly curious and detecting some sort of accent that placed him outside of the New York/New Jersey metro area. “Where?” “In Johannesburg. I was his driver.” Turning to look at him, I saw that above his mustaches grew an enormously broad nose, with the kind of cavernous nostrils that could have provided shelter to entire families of flying mammals, on a chestnut colored-face out of which a pair of very lively brown eyes twinkled. Horn-rimmed spectacles sat comfortably amidst abundant but neatly combed salt and pepper hair giving him a slightly professorial look. Guessing his accent as South African, and he of Indian descent, I asked him what he was doing here on the New Jersey transit train to Trenton. Fearing that I was being drawn unwittingly into some sort of parable, and unprepared to be any more introspective than I needed to be at that precise moment, I returned to the more comfortable subject of Manchester United and asked him how he had come to be driving Ron Atkinson around Johannesburg. Introducing himself as Rahul, we shook hands and he proceeded to fill me in on a piece of Manchester United club history of which I, a lifelong fan and amateur of the club’s storied annals, was unaware. Ron Atkinson is famous in English football, almost as much for his largely successful career as a manager of a variety of clubs as for his idiosyncratic turn of phrase that, such was their regularity and noteworthiness, became known popularly as “Big Ron-isms” or “Ronglish”. Ironically, for a man famous for his humorous mot-justes, it was a series of unfortunately racist on-air gaffes as a broadcaster that ultimately spelled the end for his career in the game, but years before that in the 1980s he had reached the pinnacle of his managerial career with Manchester United, steering them to two FA Cup victories and one European Cup Winner’s Cup triumph. Underpinning this success throughout Atkinson’s reign had been the athleticism and defense marshaling skills of goalkeeper, Gary Bailey. English by birth but raised in South Africa, Bailey began playing in Johannesburg before paying his own airfare to the UK for a trial with Manchester United. Ten years later, in the twilight of his career, in the late 1980s, he returned to South Africa to play for Jo’burg professional side, Kaizer Chiefs. It was in this period that, according to Rahul, Ron Atkinson had paid a visit to South Africa to see his old pal and taken a short holiday. Late one night, Rahul, who had encountered and befriended Atkinson and Bailey at a night club, ended up ferrying the pair of them home in the wee hours in his uncle’s vintage red Porsche. En route, Big Ron, as experienced a drinker as he was a man who knew how to plan for the future, decided that it was preferable to have a driver on hand for the remainder of his stay, being confident that this was unlikely to be the last time he’d need a ride while inebriated. For the next week, Rahul was on-hand to drive the former Man Utd boss around Johannesburg and its environs in style as Atkinson variously stopped to sightsee and slake his thirst at a variety of watering-holes. Increasingly boisterous as the day wore on, his passenger was given to beerily chanting a seemingly limitless supply of lewd songs that amused Rahul and left him with the firm impression that if he ever had a boss half as jovial as the man who was using him as a taxi, he’d be more than content in his work. On the final day of his vacation, building up to propositioning Big Ron to sponsor his UK visa on the premise that he could do the same for him around Birmingham, in Atkinson’s recent capacity as manager of West Bromwich Albion, Rahul had planned an authentic Indian lunch at a restaurant belonging to a cousin of his at which he was going to make the big ask. Again, reluctant to share any of my own recent experience with him, but seeing the obvious parallel, I responded “Good for you, and you did!” in a very banal fashion. Wagging his finger sagely as he stood up to get off at Newark Airport station, “The other lesson I learned that day: never discuss important business over lunch.” And, leaving that final aphorism hanging, we shook hands and said goodbye. He off to South Africa, I back to my family to break the bad news. Since that day, the world has lost a shining light in Nelson Mandela, an example to all of us in the art of humility and compassion. Managing to overcome his feelings of injustice and bitterness towards his jailers, oppressors and opponents to unite his homeland and attempt to reconcile its seemingly irreconcilable divides, his story and legacy have always made me hopeful. 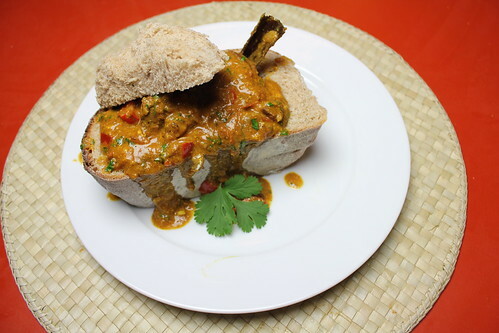 So, in recognition of his passing, and in the hope that some of madiba’s example might rub off on me and allow me to forgive those who recently did wrong to me, we decided to take a crack at one of South Africa’s signature dishes, Bunny Chow. For more people simply multiply the quantities. 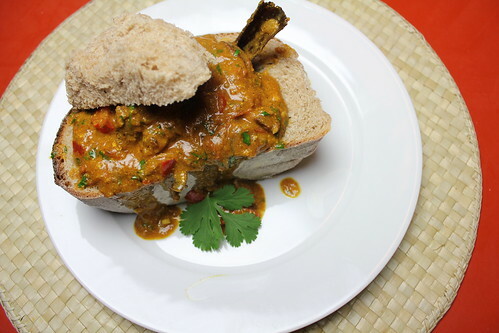 Originating in the South African coastal city of Durban, home to a large population of Indian descent, bunny chow is, essentially, nothing more than curry poured into and over quarter of a loaf of white bread. How this curry came to be served with white bread rather than with the more typically Indian accompaniments of rice and roti is not 100% clear but most theories suppose it to have been to allow Indian sugar cane cutters a way of transporting their lunches to their place of work. How the name came about is also unclear, with suggestions variously indicating it was named for the bunia caste who served it or for the bunya or banyan tree under which the curries were sold. Bunnies, as they are known, are typically ordered in the local slang as “quarter mutton”, referring to the meat therein and the quarter loaf it arrives in, and they are the ultimate scalable dish. Simply specify more of the loaf – a half, a full – to feed more people. That said, a bunny is quite filling, and it is not uncommon for a quarter to be shared between two. And no, before you ask, there is no rabbit in the recipe, although I daresay some witty soul has made the mental leap and done so, probably with great success. We certainly wouldn’t be opposed to trying it in the future either but wanted to avoid being so trite publicly. 1 large unsliced loaf of your favorite white or wholewheat/meal bread. Tin loaves are preferable as receptacles because they stand up best by themselves. In a deep, heavy pot over medium flame, heat cinnamon stick, cardamom pods and star anise in 2 tablespoons cooking oil, for 2-3 minutes. Add onions and cook until translucent. Remove onions and whole spices to a plate and reserve. Add another tablespoon of oil to the pot and cook the lamb until nicely browned on all sides. Add a fourth tablespoon of oil and add powdered spices and curry leaves, stirring well. Cook for no more than two minutes before adding garlic and chopped tomatoes. Stir mixture well until a kind of paste is formed before returning onions and whole spices to the pot and adding enough water to cover everything. Bring to a simmer and cook covered for at least an hour, preferably two. After curry is cooked, taste for seasoning, and add salt (and in our case, the juice of half a lemon) to taste. Add two or three tablespoons of plain/natural yogurt (or cream, if you’re feeling fancy) and stir well. Taste again. It should be nicely spicy and thick enough to coat the back of a spoon. If it’s still a bit thin, either continue to simmer uncovered until the right thickness is achieved, or sieve a tablespoon of flour into it, and it should thicken up nicely. Cut your loaf into quarters, pull out some of the insides and reserve. Place quarter loaves on plates. 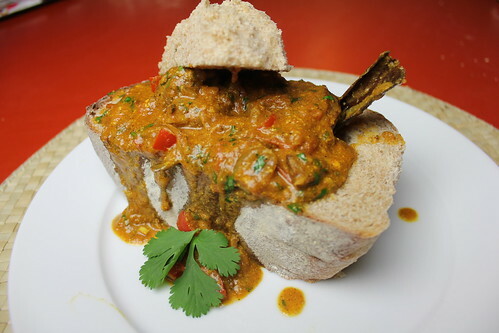 Spoon curry into hollow bread, sprinkle with chopped cilantro, and place reserved doughy inside of loaf on top. Enjoy with a bottle of chilled South African white, a cup of rooibos tea, or as I prefer, a cold bottle of Castle lager. Just logged on to see whether there might be a new post, and don’t know whether to be glad or sorry … glad that there is, but v. sorry (a) because I’m a Liverpool supporter, so no fan of tales of Man U, and (b) – much more seriously, because of the news of your unexpected and highly inconvenient unemployment. Fingers firmly crossed for a new opportunity for you ASAP. Well, Obamacare will be there for you — as a self employed person, I got a great deal on the website. There are so many of us that are in the position of being unemployed or underemployed these days. Employers are now in a position to have no loyalty whatsoever to their employees and shuffle them as they wish. It is a sad state of affairs. Judging from the quality of your writing, I imagine you would be a valued employee anywhere that has management with a good eye. I can’t help but feel you will find a better place to rest and be grateful you left the house of schmucks you worked for. What jerks. Fingers crossed for you. @Deana: thanks for the kind words and the recommendation. We’re checking out the exchanges right now, and expecting that ‘Bamacare will come through for us. I couldn’t agree more that employers have no loyalty to staff anymore, but in this case, not having to deal with the stress and pressure that came with that role is starting to feel quite liberating (as well as nerve-wracking). This comment came via email but it’s too good not to repost here. @Mamamiaoy: thank you so much for this. Just what the doctor ordered. Just so you know you are not alone – I found out I was pregnant on the day we moved out of our rent controlled $575. classic six on the UWS. I had a two year old and a six month old and we were moving to Westport CT. I couldn’t figure out a way to tell my husband while he put our belongings into the moving van. He couldn’t figure out a way to tell me he had just lost his job. Who knew that after carefully timing pregnancies I could actually be pregnant again. I made a deal with the ob/gyn so that instead of me paying before the baby was born, I would just sign over the insurance check after the baby was born and pay him. Once there was a little bird who, when he saw all the other birds flying south for the winter, went about pecking and having his own good time until the first snowflake hit him. He was startled and alarmed and began to fly furiously to catch up with the flock, his little heart beating. The snow came down harder and harder and the weight of it froze his wings and he fell frozen to the ground. Just then, a cow came along and plopped a cowpie right on top of the frozen bird. The heat of the cowpie warmed the bird (which he liked) but he soon realized he was sitting in poop. Indignant at being in the middle of all the poop, he stuck his head out of the cowpie and started to squawk at his predicament. Just then, a fox came along and ate the little bird. The moral of the story? sometimes when someone shits on you it’s for your own good. Never forgot that….hope it made you see your situation and realize that your family will never “fire” you…..but the timing of your ex-boss to do this before Xmas is proof of no heart. And, btw, love your recipes and continue to make Dominican Fried Chicken just the way your recipe calls for.